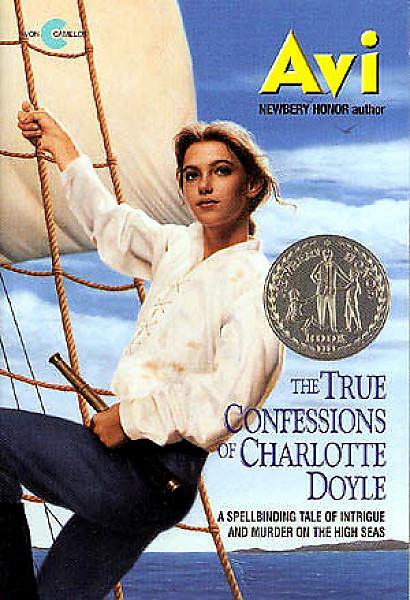 The True Confessions of Charlotte Doyle by Avi, tells the tale of thirteen-year-old Charlotte Doyle and her journey across the Atlantic from her school in England to her home in Rhode Island, United States. Charlotte is scheduled by her father to travel on the Seahawk, a cargo ship, and discovers once aboard that the two other families that were to accompany her on the voyage had cancelled. As the journey begins, Charlotte is alone, out of her element, the only lady, and aware that her presence is unwanted by the crew. Yet, one crewmember, Zachariah, an older African man that serves as the ship’s cook and surgeon offers his wisdom to Charlotte, advices her not to trust Captain Andrew Jaggery and even offers her a dagger for her protection. She is appalled by Zachariah’s disrespect for her and the captain and wants neither his friendship nor his dagger, but, in time, she will need both. When Charlotte meets Captain Jaggery, she instantly views him in the same light as her father, a gentleman and adores the time she spends with him. During their daily teas and dinners he encourages her to befriend the crew so as to be a good role-model when in actuality he is manipulating her to spy on his behalf. When Charlotte overhears that the crew intends rebel, she immediately tell Captain Jaggery, and after he stops the mutiny chooses to severely punish Zachariah, the second closest person Charlotte has as a friend on the Seahawk and informs the crew that his punishment is the fault of Charlotte who told him of their plans. Now, as Charlotte feels betrayed, depressed, and lonelier then when she first came upon the ship, she chooses to join the crew and fulfill the duties of Zachariah who’s presumed dead. The crew eventually accepts her as their own which in turn infuriates the Captain. Still traveling to America, and Charlotte enjoying her new life as a member of the crew, a hurricane changes everything. During the storm, the first mate is found dead, and not by the storm, but rather murdered with the dagger Zachariah had given Charlotte, thus, she is accused of murder by the captain and awaits her punishment, a sentence of death by Captain Jaggery. Charlotte discovers that Zachariah is hiding in the brig. In attempt to save Charlotte he attempts to overtake the ship once again, and in the battle Captain Jaggery is thrown overboard. Surprisingly, with no one to take charge, the crew names Charlotte as their new captain. She captains the ship for a very brief time before arriving in America where she is once again reunited with her family. They observe the obvious physical changes from her voyage, her calloused hands from hard labor, trousers suitable for a sailor, and her short boyish haircut. Though she tells her parents of her adventure, none believe it to be true, she is forced to resume her high-class gentlewoman life but as she find that no longer desirable, Charlotte runs away to her new home as captain of the Seahawk. It’s amazing how we see the courage and strength unfold during the course of the story with Charlotte. The True Confessions of Charlotte Doyle is a sweet, suspenseful action packed adventure story from beginning to end with more than enough surprising twist and outcomes. Charlotte is a strong female role model that many girls may dream to be like. This is a book may be enjoyed reading multiple times. Usually read for school curriculum, approximately 7th grade, and as an adult re-reading the novel gives a sense of empowerment and reassurance that even adults can still overcome any obstacle they face. Avi’s The True Confessions of Charlotte Doyle is truly a delight and an inspiration for all of those that read it, tween girls and boys alike. A book where anything and everything you wouldn’t expect to happen does. Readers that enjoy strong female roles, characters who chose to decide their own fate, willing to risk everything for their happiness and dream, as well as historical fiction will also enjoy reading Chains (2008) by Laurie Halse Anderson about a young female teenage slave that spies for the rebels during the revolutionary war in hope for her freedom, or Newsgirl (2009)by Liza Ketchum who dresses as a boy so as to make a living selling newspapers to support her family after moving to San Francisco during the Gold Rush.